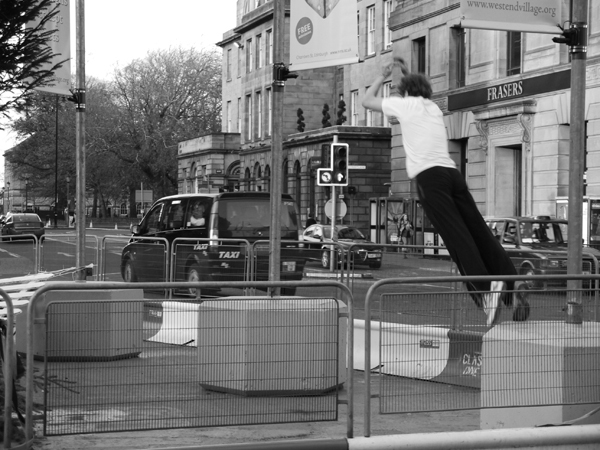 In November 2011 Landscape Architects UrbanPioneers Stadtpioniere hosted the Event JUMP THE BARRIER by Marion Preez / Myself for You with Edinburgh traceurs Gordon Tsang, Spencer Selwood and Zak Corney. 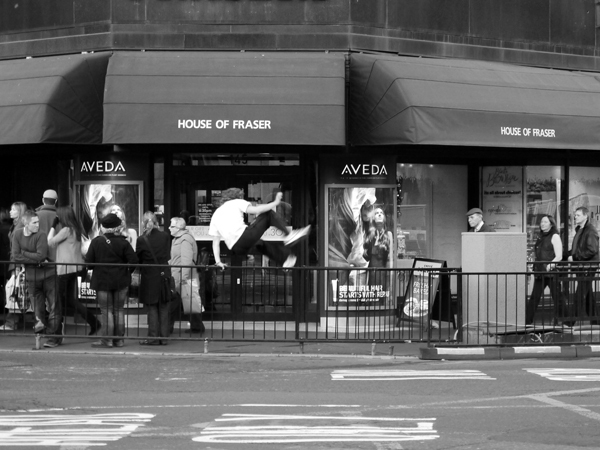 This event took place at the junction of Princess Street / Lothian Road in Edinburgh. When arriving at work this morning how many barriers have you walked around today? How many detours were required to cross the streets? When walking through our cities and towns it is almost impossible to follow our desire line, the shortest way to our destination. Instead we are guided and controlled how to move and behave within our open public space. 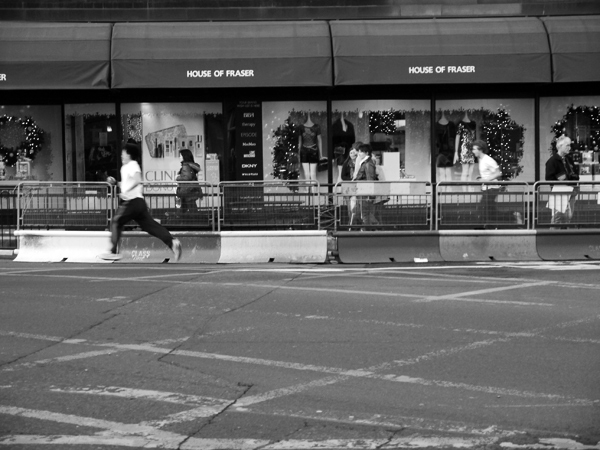 In the UK the public realm is divided with barriers, fences and railings at a much higher rate than many other countries–guiding and controlling the pedestrian’s behavior within the public space. Visually dominating, they clutter the streets from small towns to big cities. JUMP THE BARRIER explores the presence of these barriers within the public domain. 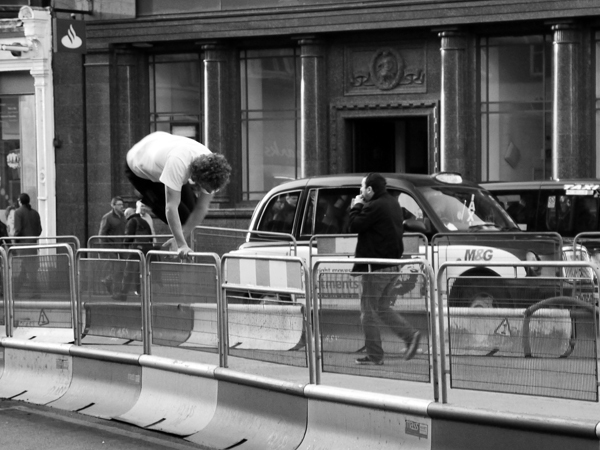 Barriers, railings and street furniture will be used to balance, drag and move, oneself as well as climbed on, hanged on, jumped along, on and over. These actions erase the separation line without removing it, temporarily destroying its function and making the usually divided space whole. Questioning those dividing lines and their purposes encourages creative interaction with the environment. It challenges our perception of restricted open space and the right to free and equal movement within this space. Uncluttered and well-designed streets are more attractive and increase levels of use by pedestrians and cyclists without increasing accident rates. 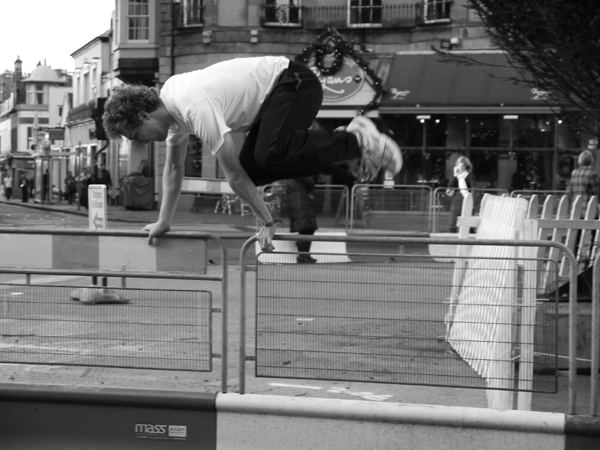 JUMP THE BARRIER will be carried out by traceurs (Parkour practitioners). 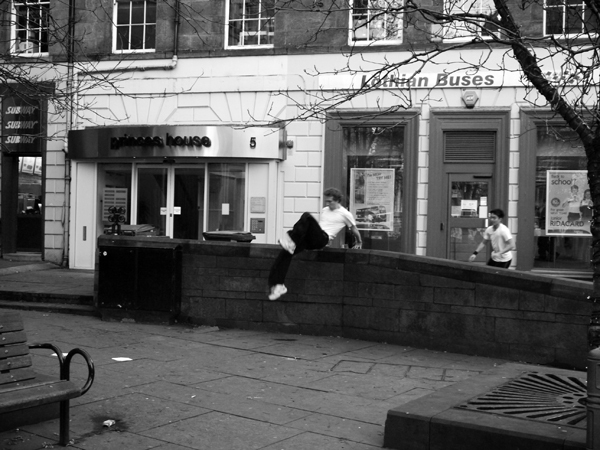 The traceurs’ aim is to use only their human body and the objects in the environment to interact by adapting one’s movements to the surroundings. 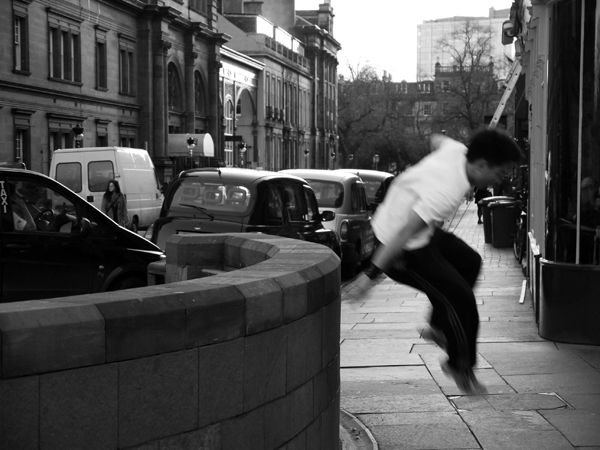 Using parkour supports the theme of free expression within one’s environment as well as respect for it. Come along, break free and jump the barrier, decide yourself which way to walk. All photographs by Alan Gordon.